Happy April! We are on Spring Break next week and while I was trying to think of some fun things we could do around where we live and some activities to do at home, I was reminded of these Easy Recycled Crayons and thought they would be a fun project for Logan and Madeline to do. Plus, I get the bonus of our kitchen art desk getting dejunked and reorganized in the process. Recycling isn’t just for cardboard, soda cans and plastic bottles. There are a lot of things around the house that can be recycled into something new. Old crayons for instance. Do you have a bunch of stubby, broken crayons? Feel bad throwing them out even though no one wants to use them because they’re so small? Instead of throwing them out try melting them down and reshaping them. 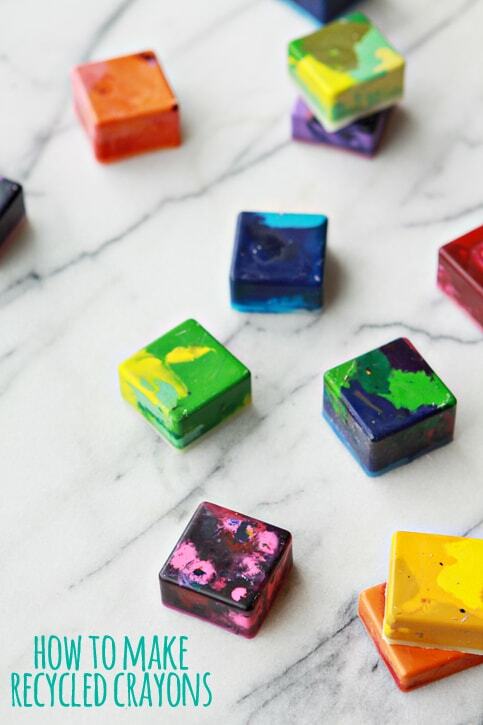 Making recycled crayons is a fun, easy project to do with kids. You can also use the recycled crayons for fun party favors or small gifts. 1. Divide the crayons into piles according to color, keeping similar colors together. 2. Remove all of the paper wrapping from the crayons. 3. Fill each try with broken crayons pieces. You can choose to keep the crayons solid in color or to make rainbow crayons. 4. Place the silicone ice cube on top of a metal baking sheet and transfer it to a preheated 250 degree F oven. 5. Bake the crayons for about 10 – 20 minutes, or until they look melted. Baking time will depend on the size of your molds and how full they are with crayon pieces. 6. Remove the metal baking sheet from the oven and cool at room temperature until hardened. Alternatively, you can chill them in the freezer for about 20-30 minutes for faster hardening. 7. 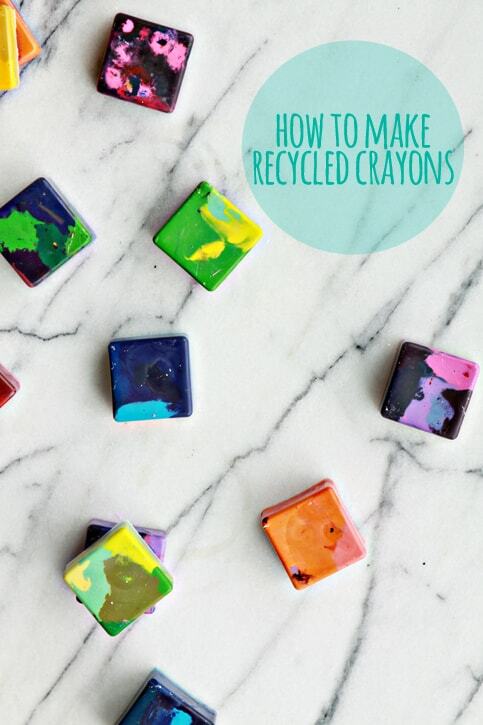 Once cooled, pop your recycled crayons out of their trays.